If you haven’t seen it before, this map represents an area of the City of Roses in which I am slowly running down all the streets. Purple represents April to June, Blue represents July to September, and green are the new streets from so far this October. It’s fine and all, and I do plan to finish it, but it’s definitely a rerun of the first version, and some of the thrill is gone. It’ll be fun! I can keep you apprised of the whereabouts of my hypothetical harrier in the sidebar. Maybe he can write in from time to time to talk about places he’s been! Maybe even – this would be pretty trippy – I could even go out and meet him somewhere! I could go running with him. Where should I/he go? I see two areas of great potential. One would be to send Avatar5000 out to explore areas of scenic, historic, or personal interest. Secondly, perhaps you’d like to invite him to come visit! You really wouldn’t need much of a guest room; he/I could just crash on the couch, or for that matter at the back of the junk drawer, or in a notebook, or wherever you keep your own abstractions. There are also two important limitations to this venture. One is that I won’t be moving especially fast. Locations in and around Bridgetown would be easy enough to pick off, but the open road will certainly be calling. On the other hand, if I were to put (for instance) FallingWater on the list of places to visit it would be quite some time before I was able to make it to southwestern Pennsylvania (Keep in mind, too, that my avatar isn’t going to use freeways, as they are unsafe and unpleasant to run on). We might also have to confine ourselves to North America, because while I would in principle be perfectly willing to run across a hypothetical Bering Strait landbridge or through the Chunnel, I can’t guarantee that my remaining running lifetime will be sufficient to get me that far. The journey begins Saturday, October 27! But where shall I/he go? If you have suggestions, or would like to invite my avatar for a visit, let’s hear about it in the comments! Everyone runs in Washington DC - no reason why an avatar shouldn't also run there! 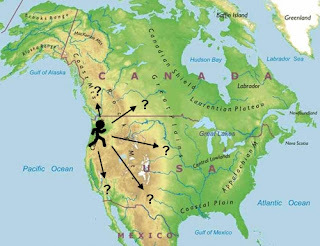 Google Maps fails to be able to show it, but from Chelan an avatar could take the ferry to Stehekin then continue up, via gravel road then hiking trail over Cascade Pass and down to Marblemount. From there, well...more ferries around the San Juans and into Canada? There's a purity to the basic west-to-east cross-continental trek that would probably get my vote. A lot like that bicycle odyssey yearning your wife has completely failed to encourage you to quit your job for! Morgan: Done! And very kind of you to offer. Calico, Jenners: Well, it looks like the East Coast might be in the offing, what with all the pressure from the Mrs. But that would be a few years out, obviously. pfly: Ferries. Hmm... I'll have to think about ferries. Libby: Your confidence in my long-term running viability is flattering. I blush to admit I have no idea if the whole "Pan-American Highway" concept ever really panned out. Could I actually make it to Patagonia? I suppose if I could take on the Bering Straits, I could take on the Darien Gap or whatever. Oh man. So, my vote goes for heading Alaska way swimming to Russia (of course, you'll have to do the swimming to get that bit done), and then heading down to visit me. Might take a while, but we're all big fans of Michael5000 avatars down here in Aussieland. Are you sure you're not yourself eligible for the Dork award? I'm not, which is a shame. I think I could put together a pretty credible application.